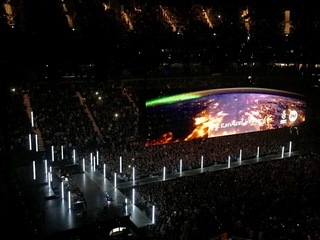 A throwaway song from an interim album formed the emotional heart of this, U2's latest tour. The lengthy stage lit by fluorescent tubes took on the form of a sanctuary and the text #refugeeswelcome appeared on the screens. A breathtaking moment from a spectacular show. Posted by pab at 23:00 | Comments will be back one day. Please email me instead!